You Didn't Think This Would Be Easy, Did You? Mark's the one on the left. We pull back the curtain a bit for our regular "Better Know a Beat Reporter" series, in which we talk to a member of the Elks Club and find out what makes them tick. Previously, we spoke with Newsday's Bob Glauber. 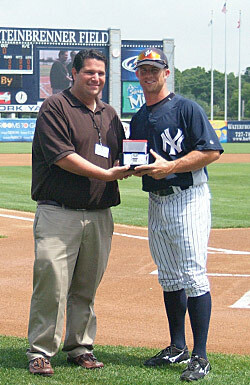 Today, we talk to Daily News Yankees reporter Mark Feinsand. Enjoy. How many games do you attend a year as a reporter? How many as a fan? I would guess that I cover roughly 125 games during the regular season, plus the All-Star Game and the postseason. This year, I attended one baseball game as a fan, as my wife and I took our 4½-year-old son to his first baseball game. I also go to two to three NFL games every year. I'm a Redskins season-ticket holder, and I took my son to his first NHL game in February. What fellow reporter would you say you're best friends with? My two closest friends in the industry (and in life, for that matter) are Sam Borden and Peter Abraham. Sam covered the team for the Daily News from 2006-07 and is now a columnist for the Journal News, while Pete was the beat writer for the Journal News from 2006-09 until taking a job with the Boston Globe last month. I've been covering the Yankees for most of the decade with Sweeny Murti (WFAN) and Tyler Kepner (New York Times), so we spend an awful lot of time hanging out together on the road. How much of a grind is this? You've been at this since early March. By this point in the season, there has to be a sense of relief that it might be over soon, yes? Not that I've ever covered another sport, but there is no beat in sports that takes more of a toll on your life than a baseball beat, period. By no means am I denigrating what my colleagues that cover basketball, hockey, or football have to deal with, but the numbers are simple: 45-50 days of spring training, 162 regular-season games, and a month of playoffs. Then the general managers' meetings, the winter meetings, nonstop off-season movement, etc. The light at the end of the tunnel is visible, but this is my favorite time of the year. The games in Kansas City or Arlington in July are the days that can become tiresome during the season, but once the playoffs start, the games are so exciting and there's so much at stake, it's hard not to get a second wind. At the same time, the baseball off-season may be more difficult than the season itself, because free agency has become this never-ending process that stretches from mid-November through the end of January (and sometimes even later). I always laugh when I see the NFL free agent signing period begin, because within 48 hours, almost every free agent of note has already signed. We're happy if the big free agents are signed by Christmas. January is really my only extended break all year. Many reporters have told us how difficult the Yankees have been to cover in the past, how reticent and withholding they've been with reporters. This is our first year covering them, and we haven't found that to be nearly as much the case as we'd been told. Has anything changed, or were those reporters just wrong? I think any team is as easy or difficult to cover as its players. In years past, the Yankees have had their share of difficult players. The hardest part of covering this team — as I'm sure you've seen firsthand — is that for every game at Yankee Stadium, there is usually a minimum of 50 media types in the clubhouse, which makes it very difficult to get any real one-on-one access. Road games are much easier to cover for that very reason, since that number shrinks to about ten to twelve on most days unless we're in Boston. Jason Zillo and his media-relations staff do a great job of getting us what we need most of the time, which is a huge plus when you're trying to cover this team. Tyler Kepner of the Times wrote a great piece in August about how different the dynamic between A-Rod and reporters has been this year. He attributes it in part to A-Rod relying more on Yankees PR people like Jason Zillo rather than outside people. Is that true? Is it harder to talk to A-Rod than it used to be? Is there a general understanding that in certain circumstances, A-Rod is better off left alone? I think the smartest thing Alex did this year was leaning on Zillo for his media strategy. It seems like his biggest troubles started when he started listening to people like Guy Oseary, who may know how to handle this stuff for the likes of Madonna, but has no clue what sports media is like. Lining up Alex to do a photo shoot where he kissed himself in a mirror is the perfect example. That stuff is edgy and perfect in the music/entertainment world, but this guy is a ballplayer. That's the key: He's acting like a ballplayer again. For a while, it seemed like Alex was more concerned with turning himself into a global brand than a baseball player. The relationship with Madonna, signing on with William Morris, the aforementioned Details photo shoot — it was just too much. When he got back from Colorado in May, he pledged to let his game do his talking. I didn't think he would keep to that word, but he has — much to his credit. Alex has never been the easiest guy to talk to, and now that he has decided to keep his mouth shut for the most part, it's even more difficult to get him one-on-one. He makes sure to talk to reporters after games when he's involved one way or another, but he's nowhere to be found before the game, which is when reporters have their chances to talk to guys alone. Then again, if he sticks to his whole "let my baseball do my talking" thing, what would be gained out of a one-on-one, anyway? Was the job more fun when there was no Twitter and there were no blogs? Or is it more fun, but just harder now? I actually think blogging and tweeting have made it more fun; it's just more of a demand on your time. As a beat writer, your job is to report the news, write game stories, and pass on information. You don't get to offer your opinion in the paper all that much, so the blog gives you an opportunity to do just that. It's also a chance to let your readers get to know you a little, which I enjoy. We also do live chats, which I love. It's like doing a talk-radio show without having to throw to the update guy. To me, the blog serves as a perfect complement to our coverage in the paper, because there's always a ton of stuff that you can't fit into the paper that used to just die in your notebook. Now, fans can get extra coverage on the blogs, and I've found that Yankees fans can't ever get enough on their team. It's a win-win for everybody. What's the mood in the industry? There are baseball teams that have, like, three reporters who cover them. It's a scary time. How has it affected the press-box culture as we've known it over the years? There's no question that times are tough in the newspaper business right now, and that's easy to see at the big events. When a paper like the L.A. Times doesn't cover the All-Star Game, that's eye-opening. Baseball isn't the only one feeling it, though — hockey has become a nonentity in most markets, and even the NBA drew less coverage during the playoffs last year, from what I could tell. Some teams have always had fewer people covering them, but that's market size more than anything. Teams in small or middle markets like the Royals, Rays, or Pirates simply don't have the same number of newspapers that places like New York, Los Angeles, or Chicago do, so it makes sense that they would have less writers on their beats. But the press-box culture hasn't changed all that much because of it. If anything, the additional work that comes with covering a team — the blogs, Twitter, etc. — have been more responsible for a culture change than anything else. Every beat reporter from another city always tells us they think New York sportswriters are insane. True? Could you cover teams somewhere else? I don't know if "insane" is the best way to put it, but covering a team in New York — the Yankees, in particular — is unlike anything else in the profession that I know of. It's a constant, nonstop competition between eight to ten people to be first with a story — no matter how big or small that story is. I don't know how I would handle covering a team where didn't have the type of fan base the Yankees have. I've often thought about what it would be like to cover a team like the Royals or Reds, where you know that by August, they're basically playing out the string. As crazy as it can be to cover the Yankees, at least they're never boring. I'll take insanity over indifference any day of the week. Who is the most fun player you've ever covered? Jason Giambi. I covered his entire time in New York, which started out with him signing a huge contract with the expectations of being a savior, dragged through his entire steroids controversy, and ended with him being this mustachioed teddy bear that won back the fans. In a group interview, Giambi was a cliché machine, but there were few players I've met that were better in a one-on-one setting. Baseball writers have a lot of time to kill in the clubhouse during the season, and few people were more entertaining to chat with than Jason. He also never held it against us that we had to ask him all the steroids questions, either — he knew it was part of the deal. He made his bed and he had to sleep in it. I've had the misfortune of covering several of them during the past nine years — Kenny Lofton, Chuck Knoblauch and Tony Womack come to mind — but I'd have to say David Wells tops them all. I know fans love him for what he did on the field (other than costing the Yankees the 2003 World Series, anyway), but he treated most reporters like absolute garbage. We don't really ask for much from players other than to treat us with respect. You don't have to be a good quote to be liked by the media; you just have to not be a clown. Wells would routinely spray his deodorant in the direction of writers and shout to the room, "Reporter repellent!" or answer a question with a belch — which he would then blow in your direction — and walk away, so respect clearly wasn't in his vocabulary. Do you play fantasy baseball? Yes, I'm in two leagues. One is made up of my friends from high school, college, and summer camp, while I'm partners with my best friend from high school in the other one. I've been playing since 1988 (I still call it Rotisserie Baseball), and while I enjoy the game itself, it really allows me to keep in touch with friends during the season, something that isn't very easy at times. Nothing keeps guys in contact with each other like good old-fashioned trash talk. People always think I'll have some big advantage because of my job, but most of the time, my job winds up hurting me more than helping. Like the year I was convinced Jeff Weaver would win twenty games for the Yankees, so I drafted him on both teams. And he stunk. My partner hasn't let me forget that one, and he usually brings it up when I tell him about a guy I think will have a huge year during the spring. Do you have a series prediction? Will it be more fun — or even better for the paper — to cover the team if they win the Series, or if they lose to the Angels? Yankees in seven. I think those three wins over the Angels in September helped the Yankees get past the whole "We can't beat those guys" thing, and unlike 2005, they have much better pitching. The Angels' bullpen also isn't nearly as strong as the ones they've had in the past, while the Yankees' bullpen is as good as it's been in recent memory. I've never covered a World Series champion (I joined the beat in 2001), so I think it would be a lot of fun to see them win it all and experience that whole ride. The 2001 playoffs were an incredible experience, but they lost Game 7, so we didn't get to cover the final Champagne celebration or the parade. I think this team has what it takes, but the Angels will be a tough challenge. As for the paper, it has to be a good thing if they win, because fans love reading about their team when it's winning. Wouldn't you?